Then each went to his own house, while Jesus went to the Mount of Olives. But early in the morning he arrived again in the temple area, and all the people started coming to him, and he sat down and taught them. Then the scribes and the Pharisees brought a woman who had been caught in adultery and made her stand in the middle. They said to him, "Teacher, this woman was caught in the very act of committing adultery. Now in the Law Moses commanded us to stone such women. So what do you say?" They said this to test him, so that they could have some charge to bring against him. 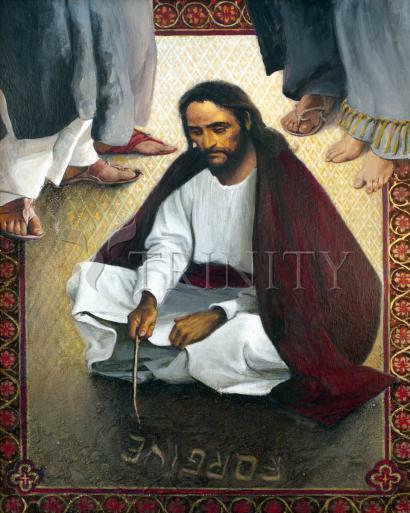 Jesus bent down and began to write on the ground with his finger. But when they continued asking him,he straightened up and said to them," Let the one among you who is without sin be the first to throw a stone at her." Again he bent down and wrote on the ground. And in response, they went away one by one, beginning with the elders. So he was left alone with the woman before him. Then Jesus straightened up and said to her, "Woman, where are they? Has no one condemned you?" She replied, "No one, sir." Then Jesus said, "Neither do I condemn you. Go, and from now on do not sin anymore." The Temple of Jerusalem was an awesome place: lots of arches, walls, towers, ornamented floors, and the great altar of sacrifice. It was there that Jesus used to teach during the day, while in the evening he retired to pray on the Mount of Olives. In the Old Testament "olives" are a symbol of the divine mercy and healing, a key to understanding this remarkable scene. As Jesus resumes his teaching in this awesome structure, a woman is dragged in front of him. It does not take long for us to perceive that this is a trap; it did not take him long either. His enemies were becoming aggressive at this point and had figured out a clever plot to question him in such a way that he would have no way out. Whatever he said would be held against him. They would then accuse him and perhaps have him discredited. The question was, "We have caught this woman in an obvious sin and the Law clearly states that such a woman should be stoned. What is your judgment?" If he said, "Don't stone her," he would be contradicting the Law. If he said, "Stone her," he would be contradicting the whole thrust of his teaching, which was that the author of the Law was Abba, the God of infinite compassion and concern for every living thing. This was a revolutionary idea. The God of Israel up to that time had been generally regarded as the God of armies, the God of thunder and lightning, the God of strict justice, Israel's Lawgiver. Jesus' idea of Yahweh transformed the Ten Commandments into a way of shaking people out of their habitual hang-ups. Here is Jesus, then, confronted with a dilemma. If he says, "Don't stone her," he breaks the Law; if he says, "Stone her," then he is abandoning his own teaching. They keep urging him, "What is your answer?" He leans over and starts writing in the sand with his finger. How long this went on we don't know, but everybody was getting restless. What was he writing? What was he doing? Nobody really knew. Maybe he was simply passing the time of day, somewhat as students at a dull lecture doodle in their notebooks. Doodling is a gesture meaning, "I'm bored" or, "This discussion doesn't interest me." His accusers were not about to let him out of the trap that they had so carefully fashioned. So they kept urging him, "Master, what is the solution to this difficult case?" At last he straightened up, looked around at those zealots of the Law and said, "Let the man who has no sin on his conscience throw the first stone." Then he bent down and continued to write in the sand. Notice that he did not challenge their right to carry out the Law; he simply insisted on a condition: "Go ahead and throw stones provided you don't have any sin on your own conscience." They got the message and so the text significantly states, "One by one they began to leave beginning with the eldest." As you get older, this business of salvation seems to become more and more elusive. The elder members of this group, with the experience of age, left right away, while the younger ones with their zeal got the message only by degrees. Finally, nobody was left except this woman and Jesus doodling in the sand. At last he looked at her and, with the pointed irony that is so characteristic of some of Jesus' sayings, asked, "Where did everybody disappear to?" He knew perfectly well where they had gone. Perhaps he thought it somewhat humorous that their trap had been foiled by that statement of his. Then he asked, "Does anyone condemn you?" She said, "Nobody, sir." Notice she said "sir." She did not call him the Messiah or rabbi. She was honest. Since she did not have any faith, she just said, "sir," the way she might address any nice man. Notice the respect Jesus has for this woman. He does not try to preach to her. He simply shows compassion by getting her out of the jam. He identifies with her in her humiliation. This is important for us to grasp in our own spiritual journey. Grace is the action and presence of Christ Jesus in our lives right now. As Christians we believe that, when the community is gathered for worship, Christ is truly present in his glorified body. Jesus identifies with sinners not by sharing their sins, but by sharing the consequences of their sins. Jesus ate with public sinners. Having a meal in common in the culture of the time was the symbol of belonging to that group of people, family, or nation. That is why the Pharisees were so shocked when Jesus ate with sinners. He was identifying with the outcasts of society -- not only with the oppressed who were unjustly rejected, but also with sinners who were rightly rejected. This means that just as Jesus identified with public sinners in the suffering that was the consequence of their sins, so he identifies with us in the sufferings that we endure because of our false self and our personal sins. We can unite ourselves to him in the full confidence that his mercy reaches out to the human misery that is the consequence of our personal sins. No matter how far we run from God, Christ is always there waiting for us. In the words of Abbé Huvelin, "Christ has so taken the lowest place that no one can take it from him." The last point in this story is extremely interesting. It is another example of the teaching contained in the parable of the prodigal son. In that parable the father's love first takes care of the most obvious sinner, the prodigal. After we have heard about the father's great mercy toward that son, we hear about the self righteous older son who had always behaved himself in a respectful and dutiful way. He turns out to be the bigger sinner, but the father shows him equal mercy. In this story we see Jesus offering his great mercy to the sinful woman, but notice that the words with which he rescued her are an invitation to the accusers to enter into their own consciences and to see what is wrong with them. The trouble with self righteous people is that they are just as much sinners as the people they condemn, only they do not know it. They are thus more difficult to help. When Jesus said, "Let the man without sin throw the first stone, "He is saying to the accusers, "How about looking into your own consciences?" He is asking, "What is your motive? Are you taking rightful responsibility for this act?" God continues to love the oppressors as well as the oppressed. We will never be able to save the oppressed unless we have compassion on the oppressors. They also need salvation. This God of ours has no favorites; he is out to rescue everybody. Many oppressors have themselves been oppressed in early childhood. The accusers of the woman thought they were upholding the Law; they did not recognize their hypocrisy in using the Law in order to entrap Jesus. He invited them to look into their consciences and face the pride that was motivating their malice. The basic question is always: What is your motive for this act? It is an invitation to conversion, to take full responsibility for ourselves, our community, nation, and religion. Jesus laid down his life for the human family. And it is by doing the same that we accept the call to follow him.